Results from a recently completed research project by the Canadian Association for the Study of International Development (CASID) and the Canadian Consortium for College and University Programs in International Development Studies (CCCUPIDS) led by Rebecca Tiessen of the University of Ottawa and John Cameron of Dalhousie University shed light on education and employment outcomes of International Development Studies (IDS) graduates in Canada. Despite the rapid growth of IDS programs, especially in recent years, there is little known about what happens to IDS students after they graduate, knowledge which could contribute to the future success of both programs and graduates. A better understanding of the career paths and employment outcomes of IDS graduates is particularly important given the relative lack of paid positions in the development sector and at a time when the ‘barista myth’ casts doubts on the employability and income earning potential of graduates with social science and humanities degrees. To address this dearth a study involving the collection of 1,901 survey responses in both official languages from graduates of 14 IDS programs across Canada (see the Full Report for more on methods) was completed in 2016. ​The survey included questions about how an IDS education impacts on the careers of graduates and their pathways from university into the workforce: Are IDS graduates happy with their careers? How much money do they earn? What kinds of jobs and what sectors do they work in? What pathways do they take to reach professional employment? Do IDS degrees prepare them for the jobs they seek? While the goal of this project was to better understand how a Canadian IDS education impacts the subsequent careers of graduates and their trajectories from university into professional careers, we recognize that the purpose of higher education extends far beyond training for the workforce. This is particularly so in IDS, where values of global citizenship are central to the mission of programs. However, the evidence presented in this report also suggests that IDS programs in Canada may need to do more to help their students prepare for an uncertain and highly competitive job market. ​The results offer a great deal to students, professors, administrators and policy makers; some reassuring and others more thought provoking, challenging all of us to think about how to enhance the educational experience of IDS students and to facilitate the growth of successful professionals and an engaged and competent citizenry. In this report we summarize specific information particularly relevant for students and recent graduates of IDS programs. For more information on the study and other helpful resources go to idsemployment.weebly.com. ▪ IDS graduates find well-paying, satisfying professional jobs in a wide range of fields (Employment Outcomes). ​At the time of the survey, less than 5% of IDS graduates were unemployed and looking for work. In total, 40% of IDS grads earned over $60,000 and 65% earned over $40,000. Moreover, over 80% of IDS grads were satisfied or very satisfied with their career trajectories. These figures are promising given the early career stages of most of the respondents (the median age of respondents was 26 and the median years of work experience was 7.7). ​However, a relatively small-proportion of IDS grads (19.1%) reported that their current employment was directly related to the field of international development. 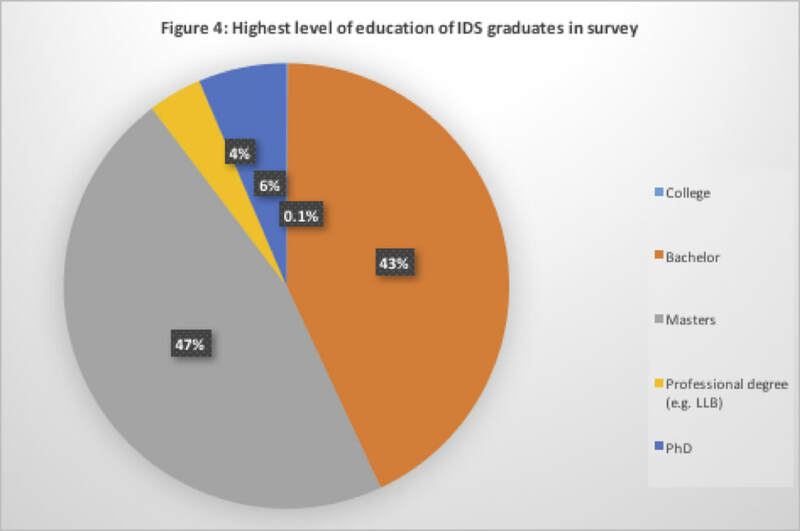 Another 33.4% of IDS grads reported indirect connections between their current job and development, but almost 40% reported no connection at all. Employment was distributed rather evenly across the private, public and civil society sectors, with approximately 30% of respondents employed in each while 10% were in academic positions and 3% self-employed. The most commonly reported fields of employment were: Government/Public Service (11.7%), Education (8.5%), International Development (6.6%), Health/Medicine (5.4%) and Law (5%). The top five job titles were Director/Assistant Director, Teacher, Project Manager, Consultant and Program Coordinator. These results suggest that despite earning good incomes and finding high levels of satisfaction, IDS grads are likely to end up working in a variety of fields, not necessarily directly related to IDS; i.e. IDS students need to have a realistic understanding of the prospects for a career in the ‘development sector’ and recognize the value of an IDS education for a variety of career paths. ▪ IDS graduates are highly educated. (IDS Graduates Post-Graduate Education). ​Over 57% of respondents had an additional degree beyond the Bachelor’s level and at the time of the survey almost 50% had plans to pursue further education and professional training. From this data and the experience of IDS grads in finding employment, it appears that increasingly an undergraduate degree on its own is not likely to be sufficient preparation for a competitive job market. ▪ IDS graduates experience significant challenges in breaking into the job market, particularly in the international development sector. (Realities of the Job Market). 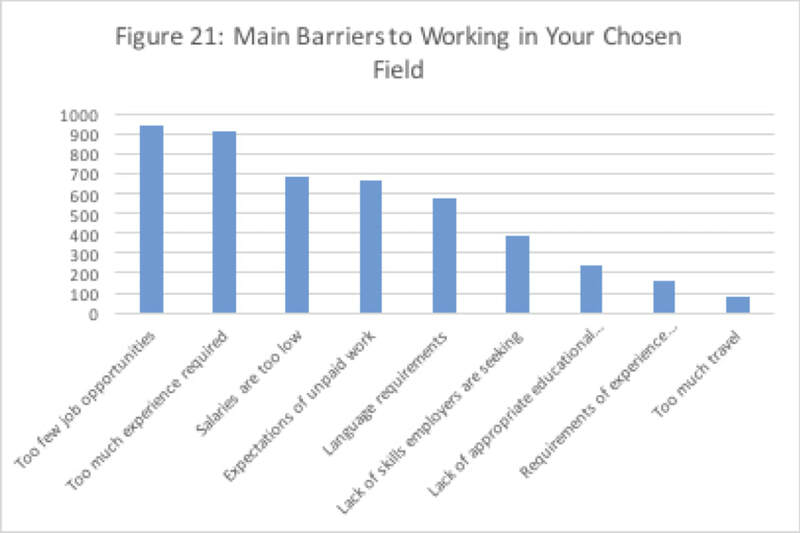 ​The most significant barriers to employment reported by IDS grads were ‘not enough jobs’, ‘too much experience required’, ‘salaries are too low’, ‘expectations of unpaid work’ and ‘language requirements’. Explore these challenges and advice on how to overcome them. ▪ IDS grads identified a number of skills and competencies important for finding a job. ​​Most prominent were the transferrable skills of written, oral and cross-cultural communication and interpersonal (e.g. teamwork) skills. While some of these skills can be learned through course-work others are more likely to come from volunteer or work experience. Indeed, many IDS graduates highlighted the need for particular skills which IDS programs did not help them develop, second language and financial management skills in particular. Skills, competencies and tools. ​Respondents repeatedly highlighted that, beyond education and professional skills, finding a job and building a career depends on establishing a strong network of professional relationships and connections. In the context of short-term contracts, it is those connections that provide the pathway from one job to the next. The capacity to build networks is also a skill: while some respondents had the benefit of pre-existing connections from family and school, others worked hard to create their own networks and were similarly successful. Explore networking tips from IDS grads. ▪ IDS grads directly linked their educational experience to lifestyle factors and values related to global citizenship. ​Respondents reported that regardless of career, their IDS education had a profound impact on their world view and ongoing values and behaviours as global citizens. 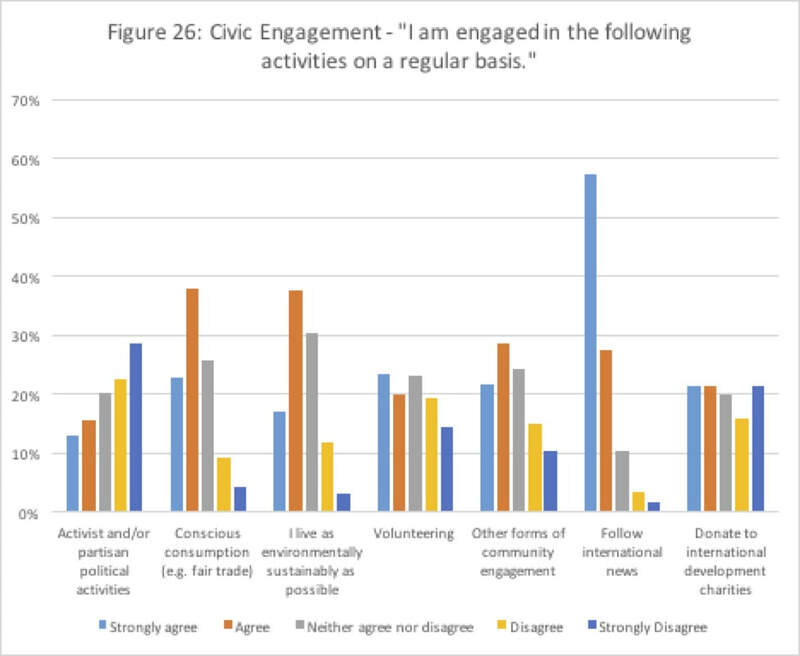 IDS shaped graduates’ political activity, community engagement and consumer behaviour. Thus, IDS degrees prepare students for professional careers but also foster their capacities for active global citizenship. This project paints a clear picture of IDS graduates as successful, highly-educated and meaningfully employed Canadians. While successful professionally, what also emerges is that IDS graduates engage more often and more substantively as active citizens; something that in today’s climate of democratic malaise and social and economic transformation must surely be an important goal of any post-secondary institution and Canada’s education system. IDS graduates’ outstanding civic engagement shines when considered in light of the trove of data linking experiential learning with improved education, professional and citizenship outcomes: IDS grads participate in these learning programs, often concurrently and with a significant global dimension, at a rate nearly 50% higher than other students, a trend which continues after graduation as evidenced in the high and varied level of civic engagement after graduation relative to the national average found by the project. ​This frequency and depth of participation in experiential learning activities, combined with a rigorous and challenging interdisciplinary curriculum, equips IDS graduates with the skills, competencies and tools to not only embrace a diverse and rapidly changing world but to actively and critically engage in its democratic transformation. While the future is perhaps uncertain it will be, like it or not, more globally interconnected than ever, brimming with opportunity and seeking those able to lead us towards a more prosperous and inclusive world.